Hybridity, fusion, interdisciplinarity, globalization… the 21st century is an era of mixing, collaboration, and multiplicity in which art and identity intertwine in both innovative and time-honored ways. This week the Walker presents Ragamala Dance and saxophonist/composer Rudresh Mahanthappa in Song of the Jasmine, a Walker commission and world premiere. The work, a collaboration between Mahanthappa and Ragamala’s artistic directors Ranee and Aparna Ramaswamy (a mother-daughter team), brings together music and dance, tradition and innovation, jazz and Carnatic music, India and America, and the spaces between. 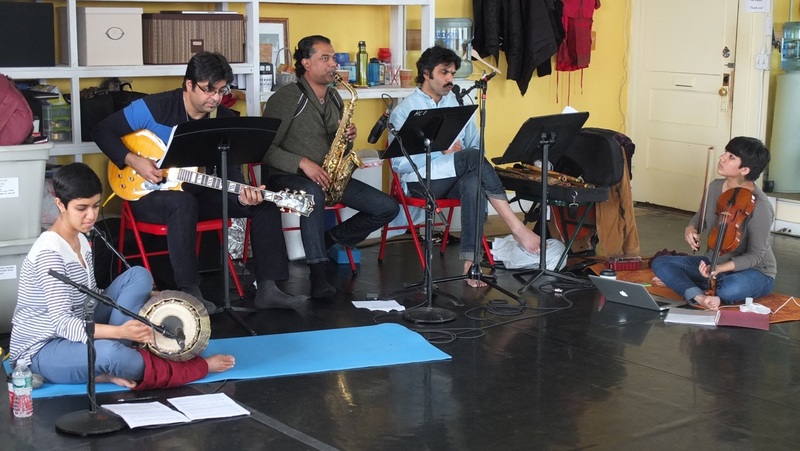 I visited Ragamala’s studio in Minneapolis’ Uptown neighborhood a few weeks ago to observe a rehearsal of the piece with Mahanthappa and the musicians, many of whom had flown in from the east coast. I came away in awe of the talent, creativity, and collaboration I observed that morning—not to mention the incredible work they were creating. As the musicians practiced at the beginning of the rehearsal, the five dancers trickled in, sitting quietly at the side of the studio and listening. Often, their arms and hands would move as if of their own accord, feeling the music and channeling the movements of the dance. 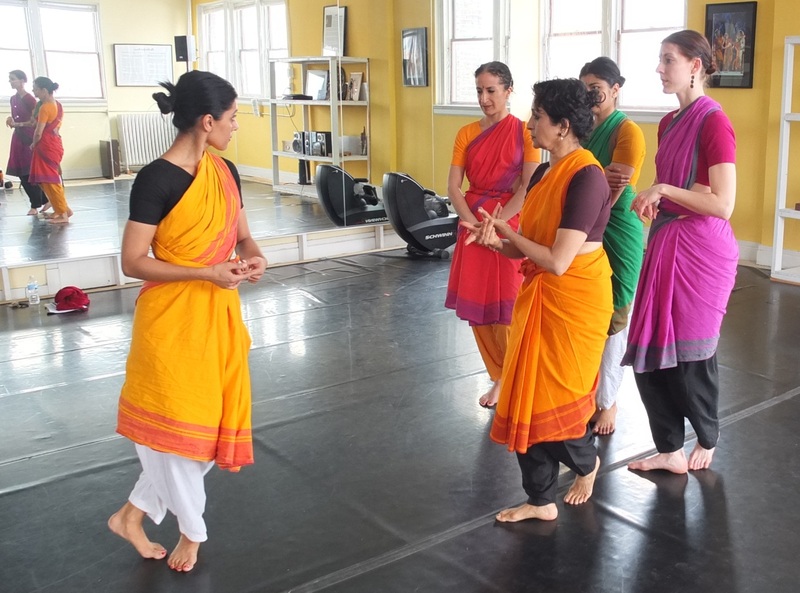 Aparna and Ranee listened closely, consulting each other and their notes, approximating the intricate motions of the dance with their upper bodies as they followed along with the music. Soon, they were up and dancing: slapping the ground with the soles of their feet, spinning in unison, telling intricate stories through their whole bodies—from the sharp movements of their fingertips to the expressive brightness of their eyes. I could feel their excitement at having the piece coming together, the performance approaching… during a break, dancer Ashwini rushed over to show me pictures of the set they were working on at the Walker: hundreds of bells suspended majestically over the McGuire Theater stage. Founded by Ranee Ramaswamy in 1992, Ragamala Dance performs Bharatanatyam, a type of traditional south Indian classical dance historically performed in the temples of Tamil Nadu. Based in Minneapolis, Ragamala has an extensive history with the Walker. In 1998, Ranee Ramaswamy performed a solo, Where The Hands Go, The Eyes Follow. Presented in one of the Walker galleries, it was four performances of a collaboration with Minnesotan poet Robert Bly, Jim Moore, Janet Holmes, Mary Easter, Coleman Barks, Janet Hirshfield, and jazz musician and harmonica player Howard Levy. In 2004, Ragamala performed Sethu (Bridge) in the Minneapolis Sculpture Garden with Balinese gamelan ensemble Çudamani, and collaborated again with Çudamani in 2009 to perform Dhvee (Duality). Aparna Ramaswamy has additionally performed with Penelope Freeh as part of the Walker’s Momentum: New Dance Works series in 2004, and curated Choreographer’s Evening 2012 with Patrick Scully. Another Walker-Ragamala connection is Jessica Fiala, a Walker guest blogger and tour guide who has been dancing with the company since 2006. In a short phone interview, Fiala elaborated on the style of Bharatanatyam: based on structured positions and movements, the foundation of the dance is a grounded stance with the knees bent and the feet turned out. Some of the poses and figures in Bharatanatyam are even likened to sculptures, echoing the positions of statues of Hindu gods. But beneath all of the structure, Fiala, explained, there is an emotional basis that informs the movement and expression of the dance, involving every part of the body from the feet to the eyes. Aparna Ramaswamy and Ranee Ramaswamy (both in orange) discuss choreography with dancers Tamara Nadel, Ashwini Ramaswamy, and Jessica Fiala. Photo: Lydia Brosnahan. The music of Song of the Jasmine is based in the Carnatic tradition, a style of classical music from south India (its counterpart being Hindustani music in northern India). The foundations of this style of music are talas, beat cycles that determine the rhythm, and ragas, musical modes that determine the melodic line (though with notable differences from Western musical modes). The mridangam drum brings everything together: the ragas, the talas, and the rhythms created by the dancers’ feet, which often beat in counterpoint to the music. So what does an alto saxophonist with an MFA in jazz composition have to do with Carnatic music? For Mahanthappa, born in Italy to Indian parents and raised in Boulder, Colorado, both Indian music and jazz are integral to his art. A defining moment, he explained in an interview with NPR, came after a recital at Berklee College of Music, when his brother gave him a copy of Saxophone Indian Style by Kadri Gopalnath. Through alternative fingerings and modifications to his embouchure, Gopalnath had created an innovative way of playing the tonal modulations present in Carnatic music on an instrument that was not designed for that musical style. The CD, initially intended as a joke, provided a way for Mahanthappa to conceptualize bringing together his background in jazz saxophone with his interest in Indian music. Rajna Swaminathan, Rez Abassi, Rudresh Mahanthappa, V. K. Raman, and Anjna Swaminathan in rehearsal for Song of the Jasmine with Ragamala Dance. Photo: Lydia Brosnahan. The creative union of music and dance in the studio was evident in the steady back-and-forth between dancers and musicians as they composed, choreographed, and rehearsed. Bars of music were deleted and repeated, footwork clarified, and tempos adjusted—in one instance, Mahanthappa even revised a part of the composition to be played twice as fast, to match the feeling of the choreography. Throughout the rehearsal, Aparna maintained close communication with mridangam player Rajna, whose steady drumming united the rhythm of the music and the rhythm of the dancer’s feet. “See the music, hear the dance” is a philosophy fundamental to the work of Bharatanatyam master and the Ramaswamy’s teacher Alarmél Valli (it is also the name of a show by Valli). Indeed, the raga in Ragamala’s name is no coincidence: literally translated, Ragamala means “garland of ragas”—i.e. Carnatic melodic modes. Music has always been an inextricable facet of Bharatanatyam, in which footwork and melodies, rhythm and danced shapes are closely connected, whether in concordance or opposition. Additionally, the term Ragamala describes a type of medieval Indian paintings, each of which is associated with a raga, as well as a specific poetic verse—an early example of art drawing from multiple disciplines. In its first performance as a dance company, Ragamala took inspiration from these paintings and their corresponding verses and melodies, bringing them to life through dance. Song of the Jasmine carries on the tradition of interdisciplinary work by uniting music and dance in a productive meeting of minds and creativity. The piece, and the process through which it has been created, is exemplary of the immense creative potential of the 21st century and beyond: collaboration across disciplines, states, and countries; hybridity of genres and identities; and the symbiosis of tradition and innovation. Ragamala Dance and Rudresh Mahanthappa will perform Song of the Jasmine Thursday-Saturday, May 15–17 at 8 pm and Sunday, May 18 at 2 pm in the McGuire Theater.